November 2015: New band alert... Economy Island. Shows! I'm in a new band - it's called Economy Island. Along for the ride with me is John Christoffel (DigDug, IBM, We'll Go Machete, Skyscratchers), Richi Fatheree (SpiderCobra), and Paul Ahern (The Adults). We've played a few shows so far, and are currently finishing up a recording that will be released sometime in 2016. We're playing a couple shows coming up with our friends in The Ex-Optimists, from Bryan, TX. The Ex-Optimists are without a doubt one of my favorite bands in Texas currently, and the two shows we're playing with them are both record release shows for their great new LP, titled "Phantom Freight". If you're in Houston or Bryan/College Station, come out to one of these shows! 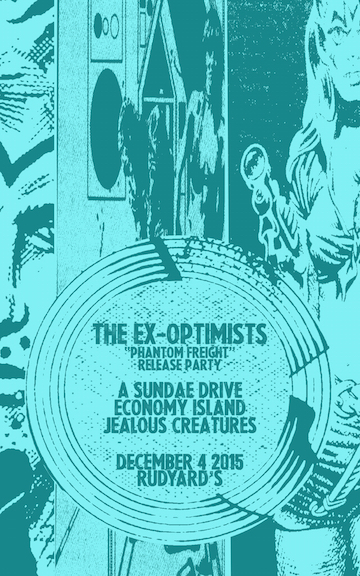 Dec 4th, 2015: The Ex Optimists / A Sundae Drive / Economy Island / Jealous Creatures at Rudyards in Houston! And then, the next night, Dec 5th, 2015: The Ex Optimists / Only Beast / Golden Sombrero / Economy Island at Revolution in Bryan!